Did you know the sound of gunfire is the most hazardous non-occupational noise that Americans are exposed to? It's possible that a single shot with an unprotected ear can lead to immediate and permanent hearing loss, often accompanied by tinnitus (ringing, hissing, or humming in the ears). Just because you might have shot without protection in the past, and without apparent hearing loss, does not mean you might not get hurt the next time. A dangerous sound is anything over 85dB. Most gunshots average a dB level of 157. It's important to wear hearing protection every time you shoot a gun to avoid possible hearing damage. Noise Reduction Rating (NRR) is the hearing protection rating method used in the U.S. The current range of NRR available in the U.S. market extends from 0 to 33 dB. The NRR is derived from an involved calculation that begins with attenuation test results from at least ten laboratory subjects across a range of frequencies. Two standard deviations are factored in to account for individual user variation and several corrections and cushions are included to make the NRR applicable to a broader population, and a wide variety of noise sources. While it is not a perfect real-world measure of attenuation, the NRR is the most standardized method currently in use for describing a hearing protector's attenuation in a single number. The NRR estimates the amount of protection achievable by 98 percent of users in a laboratory setting when hearing protectors are properly fitted. The higher the NRR, the greater the noise level is reduced. Now that you know the importance of hearing protection, we are here to help you select the right one for you. Both electronic headsets and classic earmuffs have advantages and disadvantages. Earmuffs offer comfort without any direct pressure inside the ear canal. The three common designs of earmuffs are the standard over-the-head, cap-mounted, and behind-the-neck varieties. The cap-mounted models are designed to mount directly to most hard hats that have side-accessory slots. 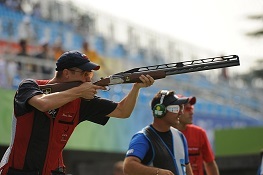 The behind-the-neck style can also be used while wearing head wear or hard hats and is often preferred among shooters. Some advantages of classic earmuffs are that they're less expensive than electronic headsets and they tend to have a slightly higher NRR. Electronic earmuffs provide the same protection as standard styles but also offer other advanced features. These headsets allow you to protect your hearing from loud noises while still being able to listen to low sound levels, such as conversations. Other features besides distortion-free amplification can include audio jacks, automatic shut-offs, and volume controls. Electronic headsets are available in multiple models like traditional earmuffs but are more expensive and often require batteries. 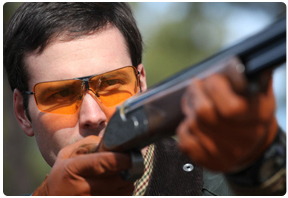 Shooting safety glasses are available in a variety of styles and protection levels. The most common are ANSI-approved shooting safety glasses. These are designed from shatterproof polycarbonate lenses, which provide 99.9 percent U.V. protection. Ballistic glasses are also popular for shooters. Ballistic-rated safety glasses protect against impact energies four times higher than ANSI and CSA safety standards. These shooting glasses are common for the military and law enforcement.